(Phys.org)—In 1952, chemists Stanley Miller and Harold Urey conducted a famous experimental simulation of the conditions thought to prevail on early Earth in order to determine possible pathways to the creation of life. The Miller-Urey experiment used water (H2O), methane (CH4), ammonia (NH3) and hydrogen (H2) sealed inside a glass flask. They introduced water vapor from a separate flask while firing electrical sparks between electrodes to simulate lightning. The chemists maintained this reaction for a week, and then chemically halted it. Analyzing the resulting solution, they positively identified amino acids glycine, α-alanine and β-alanine, along with evidence of the existence of others. Decades later, more sophisticated tests of the original solution preserved in a sealed container positively identified 20 amino acids. Though this result provides a clear pathway for prebiotic chemistry that could have led to the emergence of life, the experiment has been criticized over the years because the gas mixture Miller and Urey used was considered to be too reducing, and because the production of only amino acids was of limited relevance. Still, the duo pioneered the laboratory simulation techniques now widely used to explore the origins and basis of life. And a recent study by researchers in the Czech Republic specifically sought to validate and extend the results of the original experiment. Their results have been published in the Proceedings of the National Academy of Sciences. 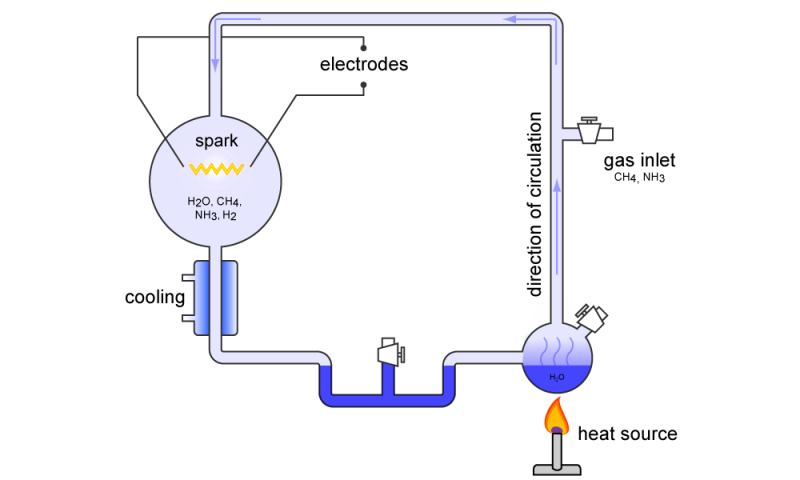 Their experimental setup was similar to the original experiment, using a simple reducing mixture of NH3 + CO and H2O. In addition to electric discharge in water vapor, they also subjected the solution to powerful laser discharges to simulate the plasmas resulting from asteroid impact shock waves. The results of the experiment demonstrated that all RNA nucleobases were synthesized, strongly supporting the emergence of biologically relevant chemicals in a reducing atmosphere. In their paper, the authors write, "As the most important finding, discharge treatment of NH3 + CO + H2O led to the formation of a significant amount of formamide and hydrogen cyanide (HCN)." This result is key, as formamide has been experimentally shown to create guanine, an RNA nucleobase, at high temperatures under ultraviolet light. "Additionally," the authors write, "we detected all of the RNA canonical nucleobases—uracil, cytosine, adenine and guanine—together with urea and the simplest amino acid, glycine… these findings support the idea that a NH3 + CO + H2O atmosphere can substitute for pure formamide and act as a starting environment not only for the formation of amino acids, but also of RNA nucleobases." The researchers also demonstrated that any nucleic acid base can be decomposed to a reducing gaseous atmosphere by electric discharges in the presence of water, and these gases can react in turn to produce all the RNA nucleobases. They also note that their results do not preclude other scenarios, but demonstrate that multiple pathways to the production of RNA nucleobases are possible. The Miller–Urey experiments pioneered modern research on the molecular origins of life, but their actual relevance in this field was later questioned because the gas mixture used in their research is considered too reducing with respect to the most accepted hypotheses for the conditions on primordial Earth. In particular, the production of only amino acids has been taken as evidence of the limited relevance of the results. Here, we report an experimental work, combined with state-of-the-art computational methods, in which both electric discharge and laser-driven plasma impact simulations were carried out in a reducing atmosphere containing NH3 + CO. We show that RNA nucleobases are synthesized in these experiments, strongly supporting the possibility of the emergence of biologically relevant molecules in a reducing atmosphere. The reconstructed synthetic pathways indicate that small radicals and formamide play a crucial role, in agreement with a number of recent experimental and theoretical results. So much for the need for an anthropomorphic god.